The Council of Corfu and especially the overwhelming majority of nobility were friendly with the Venetians. 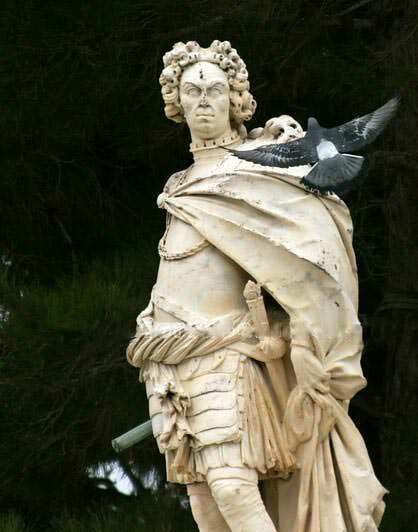 They did not expect protection from the collapsing Byzantine Empire, and because of the ever-present Turkish threat, they asked at 1386 AD for the protection of the Republic of Saint Mark. Venetians knew that Corfu was a key strategic location to guard their naval interests in the region, and also a very fertile island for agriculture, therefore they bought the island from the kingdom of Naples, paying an amount of 30,000 gold ducats. Then disembarked their forces in Corfu led by the “Admiral of the Gulf,” Giovanni Miani. The Venetians sent army to capture the two forts, and while Aggelokastro surrendered almost immediately, the Angevins and Corfiots of Kassiope resisted furiously, the Venetians got angry to such an extent that after the conquest of the castle they destroyed it completely and for this reason there are now only remnants of that fort. Thus started the second long period of Venetian rule in Corfu that lasted more than 400 years, actually 411 years, 11 months and 11 days precisely. Venetians established the feudalistic system to rule, There were three social classes, the nobility of aristocrats, the citizens (civili) and the poor people (popolari). In the next painting we see a typical snapshot of medieval Corfu, currently called Nikiforos Theotokis street, apart from the costumes have not changed much since then. 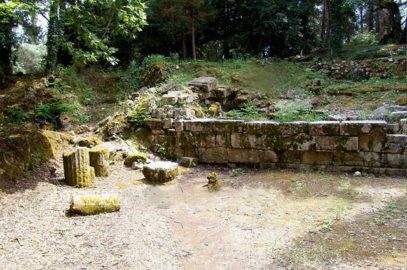 Agriculture had developed with the planting of many olive trees, Arts and Science were also evolving now that Corfu had links with one of the great empires.. The Venetian era left indelible marks on Corfu in all areas such as art, musical tradition, culture, the singing pronunciation of language, Corfiot cuisine and most noticeably the architecture of the city and the villages. The constitution in Corfu, and in all the Ionian islands during the Venetian occupation was exclusive, all political power was in the hands of the nobility, the only Venetians were the General Proveditor of the Sea who wielded the greatest political power, and his Judiciary flanked by Vailos and his two consultants. All the rest were local nobles whose names were written in the Golden book (libro d`Oro). Centuries later during the era of the second Ionian state, only the people whose names appeared on this list were allowed to take their coffee on the Liston area! In early editions of the Libro d`Oro the names all the noble of Byzantine origin, also Byzantine soldiers and large landowners were written, but later many wealthy civilians who were able to offer financial support to the Treasury of the state, were added too. If we look at the names in the libro d`Oro, we see, with surprise that most names known in the city of Corfu today are written there, but few of the common village names. 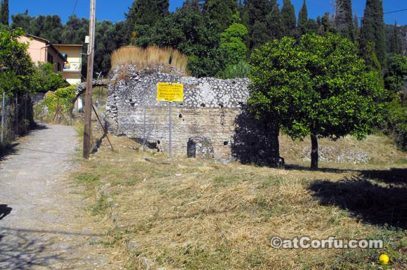 The Venetians did well to protect the city of Corfu, but despite their military measures in the first centuries they failed to protect the island’s countryside which saw many tragedies and often paid a heavy toll in barbarian raids. It also suffered from pirate attacks, especially during the first two major Turkish raids, one in 1537 and the second in 1571. In 1537 AD the Turks invaded and seized 20.000 men from the countryside to sell as slaves in Konstantinople and Egypt,. The countryside was devastated, so many Greeks from Peloponnese, Epirus and Crete came as migrant workers to the island, and later became part of the resident population. More recently especially under the British rule, many immigrants came from the small Mediterranean island of Malta, the original home of many, mainly Roman Catholic, Corfiots. 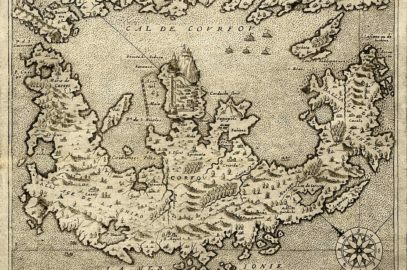 Following the raids of 1537 Corfu was almost deserted, and a few years later, in 1571 the Venetians lost Peloponnese, Crete and Cyprus, all three islands were conquered by the Turks,. This created the inevitable large wave of refugees from these areas looking for new home, and the Ionian Islands was the ideal destination, so by this coincidence the Turks both depopulated and helped repopulate Corfu. The Venetians also gave impetus to this migration stream for at least two additional reasons, firstly to revive the dead countryside, and secondly to encourage people with great spiritual, military, technical and economic potential to leave the Turkish dominated land- which would also weaken the Ottoman occupiers, and at the same time strengthen Venice. A large group of refugees came from Nafplio and Monemvasia, half of them settled in the area of Lefkimi and build Anaplades village, the others scattered on the northeast coast, from Pyrgi up to Kassiopi. Their leader was the chieftain Barbatis, and the area south of Nissaki is called Barbati after him. There is a suburb north of the city called Stratia, formerly known as Anaplitochori. The largest group of all was from Crete, many settled in Garitsa, just south of the city, and the most prosperous new arrivals moved into the city itself. Others built the village of Saint Markos in the north above Ipsos, whilst in the south of Corfu the villages of Stroggyli, Messonghi, Argyrades and Kritika were also established by Cretans. All these populations introduced elements of their tradition and culture to Corfu, especially the Cretans who contributed much to the formation of the Corfu idiom which anyway was constantly evolving, the prefix “chi” instead of “tis” is pronounced like this only in Crete and the Ionian Islands. 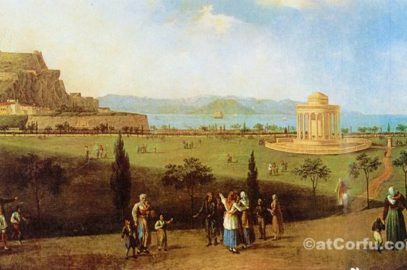 Later on around 1800, a large group of refugees from Souli, after its destruction by Ali Pasha, fled to Corfu and most of them settled in Benitses, their descendants today constitute about 70% of the Benitses population. 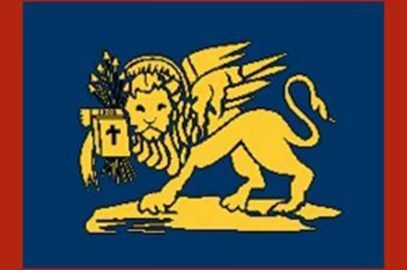 The Venetians tried to convert the population to Catholicism, but they did not succeed, and later for political reasons, as they had come into conflict with the Vatican and especially after the loss of Cyprus in 1571, they abandoned any such effort, and justified this religious tolerance with the famous saying “Siamo prima Veneziani e poi Cristiani”, which means, we are first Venetians and then Christians. Indeed to be liked by both faiths they organized and established many common religious events in which both faiths took part , some of these events are still observed today. The failure of the Venetians to protect the countryside and suburbs of the town from Turkish incursions roused wide public discontent. Moreover, especially after the loss of Crete and Cyprus, Corfu was the most important possession after Venice herself, and therefore they decided to increase the island’s defences. 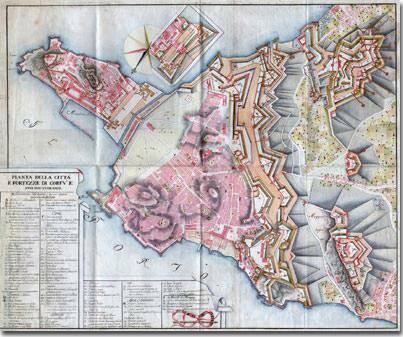 The Venetians made the most ambitious defense plans, by constructing the largest and most modern fortifications of the age for Corfu..
From 1576 to 1588 they built a new fortress on the hill of San Markos in the west of the town, then cleared the open space in front of the old fortress to make the vast Esplanade Square. They joined the two fortresses with a wall that protected the whole city from the west, with powerful defensive systems like the bastions of Raimondos, St. Athanasius and the bastion of Sarantaris, also they built four main city gates for residents and two more gates for military purposes. The four main gates of the city were the Porta Reala, the Porta Raymonda, the gate of Spilia and the gate of Saint Nicholas. Porta Reala was of unique beauty and was demolished without reason in 1895 creating an international outcry. These defensive plans were made by the engineers Michele Sanmicheli from Verona and Ferante Vitelli. Fortifications were constantly enhanced and later in the 17th century another wall was added outside the existing one, designed by the engineer F. Verneda, following the third great Turkish siege in 1716 which was successfully repulsed by the Prussian Marshal Johann Mattias Von Schulenburg, who then had responsibiliy for the defense of Corfu. After the Turkish invasion of 1716, Venetians fortified the island of Vido too, and the hills of Avrami and Saint Sotiros, they also built a fortification for the area of San Rocco (today Saroko). 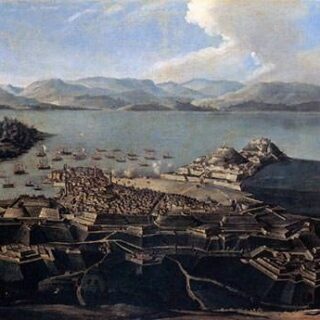 The 1716 siege of Corfu was part of the Seventh Venetian-Turkish war, the occupation of this strategic importance`s island would open the path for the occupation of Venice and then the rest of Europe. Turkish forces estimated that were 25000-30000 men along with auxiliary and irregulars and 71 ships with about 2,200 guns, if we add the crews of the ships they were reach a total power of 45-50,000 men. 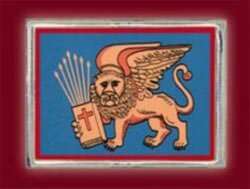 On the contrary the military forces of Venice was only 3097 men, of whom only 2,245 combatants. Corfu New fortress where the big fights held, had 144 guns and four mortars. Marshal Johann Mattias Von Schulenburg who had the responsibility of Corfu defense, managed to successfully deal with the chaos that prevailed within the local population, locals trying in every way to leave the island or take refuge in the mountains. He immediately ordered the recruitment of those who were able to fight and so secured several reservists and revived the morale of the besieged. 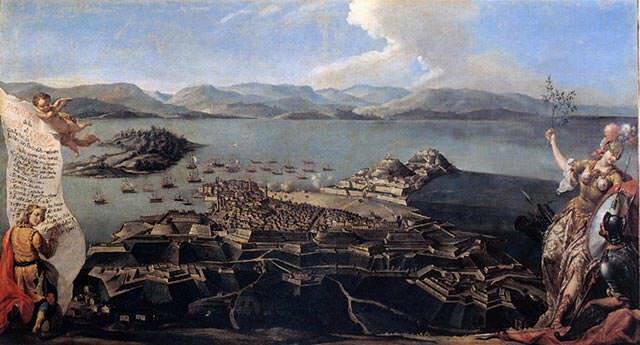 The siege had begun on July 8th when the Turks landed in Ipsos and Gouvia and ended after many cruel and deadly battles on Saturday August 22th. Meanwhile at 20th of August an unprecedented storm scattered the Turkish ships and drowned many Turkish soldiers and sailors. This storm and the salvation of the city, was attributed by the common people to a miraculous intervention by St. Spyridon, and ever since then there has been a litany, and a procession of Saint Spiridon on 11th August. But despite people’s believe, the historic truth is that two were the main causes for Turkish defeat, first the strong resistance by the defenders up to the last minute, and second the defeat and destruction of the Ottoman army in Peterwardein by Eugene of Savoy, which forced the Turks to retreat. Yielding the victory to divine intervention, we misrepresent history and underestimate the heroism of the defenders. Final losses for the defenders were about 800 dead and 700 wounded while for the Turks losses were high and reached 6,500 men, among those killed was Muchtar, grandfather of Ali Pasha. Fighting alongside Corfiots were Venetians, Germans, Italians, 4 Maltese ships, 4 Papal galleys, 2 galleys from Genoa, 3 galleys from Tuscan, 5 Spanish galleys and even Portuguese forces who also participated before the end of the siege. The Jews of the city showed great courage in fighting, equipped at the expense of the Corfiot Jewish community and under the leadership of the son of Rabbi himself. General Proveditor of Corfu was Antrea Pizanis who had the leadership of the light fleet and adjutant of Marshal Schulenburg was the Corfiot Lieutenant Dimitrios Stratigos. Marshal Schulenburg was honored for his determination and bravery to life pension from the Senate of Venice and his statue can still be seen at the entrance of the Old Fortress, also everyone who showed bravery during the fighting was honoured. 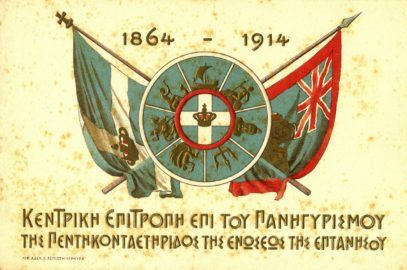 The Turkish failure in Corfu was a historical event of enormous importance, a landmark that influenced the historical course of all Europe and especially of Greece. Very few know that without the bravery of Corfiots and many Europeans the course of the Turks certainly would have not stop here and the Ottoman Empire could expand instead of collapsing, with obvious implications for the nascent Greek nation and Europe itself. Unfortunately it was not treated by historians with deserved importance, the Turkish invasion to the West was permanently blocked, they overlook the fact that without this victory today`s Greek state might not existed! 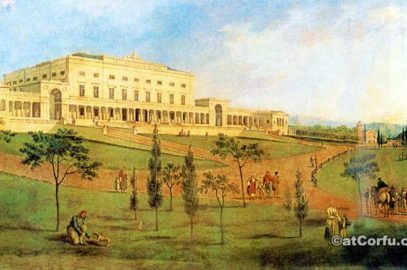 Τhe repulse of the Turkish invasion of 1716 has been very important event for Western Europe at that era, it was celebrated with impressive events in Europe, the oratorium Juditha triumphans by Antonio Vivaldi was written because of this event and played in all the major theaters for many years. This was the last of many Turkish attempts to expand their empire into Europe. 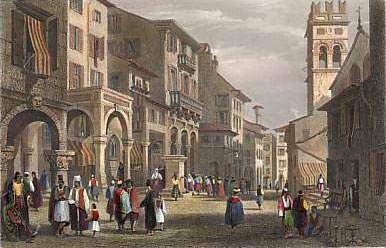 The period of Venetian rule left many positive elements in the culture and civilization, but was also marked by many dark spots, there were numerous popular uprisings, mainly in the villages due to the authoritarian rule of the Venetians and the arbitrariness and lawlessness of the ruling class of nobles,. Relations between people and nobility was like relations between slaves and master, and there were many bloody uprisings. Corfu was very important to Venice, and remained an integral territory of the State until the fall of Venice to the French.